Below, you'll find our recent updates, newsletters, publications and more. March Madness is the time for analysis and projection, of assessing performance to date and forecasting the future. We’re proud of the performance of “our team”—of the hundreds of individuals and organizations across Washtenaw County that partner together for impact! Given her lifelong philosophy, it is fitting that as part of her estate, Tamara provided a generous gift to the AAACF Arts Endowment. In recognition of her generosity, AAACF has established the Tamara Real Fund for the Arts within the general arts endowment. AAACF's 2019 Education E-News has been sent out! See updates to the Community Scholarship Program, 2018 classroom grants, 2019 scholarships that are open, and more. Didn't receive it? Sign up today or read the full article online. From supporting seniors to encouraging kids' philanthropy, from the ongoing leadership of past Trustees to emerging young leaders, and multi-pronged support for education and youth initiatives, AAACF represents philanthropy for all ages! Follow the links to read the full article online. Join Us for an Ypsilanti Area Community Fund Happy Hour! 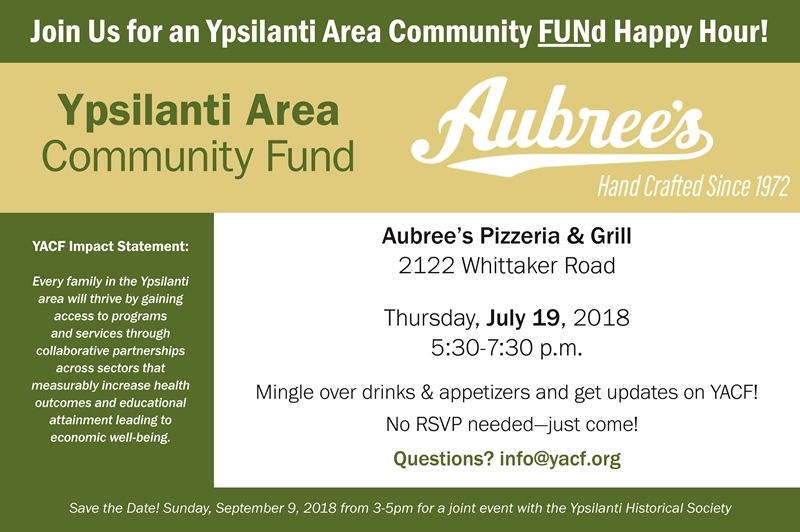 Join the Ypsilanti Area Community Fund at Aubree's on July 19 for a happy hour! Learn more about the new impact statement and ongoing work in our community. AAACF’s Vital Seniors Competition Announces Ten Finalists! The Glacier Hills Legacy Fund (GHLF) at the Ann Arbor Area Community Foundation (AAACF) is pleased to announce ten finalists in the Vital Seniors: A Community Innovation Competition, a $2.5 million initiative designed to catalyze high-impact innovation and create enduring outcomes for vulnerable seniors and their caregivers in Washtenaw County. Many thanks to the 430+ people who joined us for the 2018 Annual Community Meeting on May 7th! We were excited to engage with such a broad group of the community with another record crowd at Washtenaw Community College. AAACF is pleased to announce that we are now accepting applications! Available grant programs include the Dedicated Grant Program and Community Grantmaking Program.